*It says Saturday but I'll plan to be there for the early part of Sunday. Or if Saturday is bad weather...longer on Sunday. 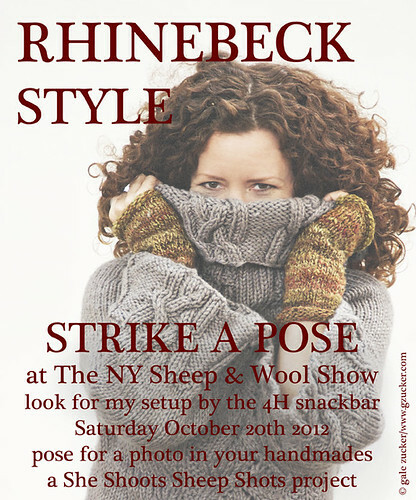 WHY: A couple of years ago, I was thinking how my very favorite part of the NY Sheep & Wool Festival, AKA Rhinebeck, was looking at what everyone wears. 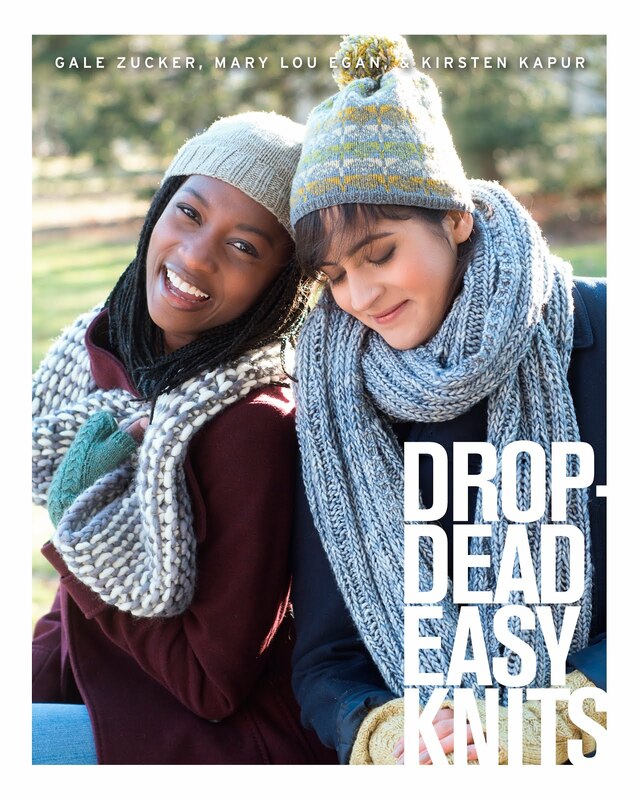 It is perhaps the only place on earth you can be wearing handknit socks, a handknit sweater, a shawlette over it, handknit mitts and a hat--and instead of having people leave a wide path around you, you are embraced by strangers shrieking "ooh, is that a Damson? I love what you did with your February Lady Sweater! Whose mods?" and..this year I suspect.. "whoa! that is an amazing Color Affection combo!" I realized I wanted to make a collection of all those fabulous outfits, for the permanent record. So in 2010 I set up my backdrop and made 128 portraits. I blogged about it a little here. This year, I'm continuing. I hope you'll be part of it! WHEN: You can find me with my backdrop, set up by the 4H snack bar, most of Saturday. Depending on the weather, I might be there for part of Sunday too. I'll tweet what I'm doing about this @galezucker and also post to my FB page. It should look a little bit like below, from last time. This year I am thrilled to be setting up the backdrop by the animal barns on Friday, because it wouldn't be Rhinebeck without the livestock and those who raise them. If you are there with your animals, please look for me Friday afternoon and come strike a pose with a woolly/fibery critter! I would also love to shoot some vendors-- they are so busy..but we'll try! WHAT am I going to do with all these photos? I don't know yet. It might make a cool ebook. Or real book, or booklet, or one-off magaziney thing... I'll email everyone once I've got it figured out. WHY have I not done something yet with the 2010 shoot? Well..when I first shot it, I wasn't sure what my goal was. (I still don't. That's the fun of a personal project, as we photographers like to call them). I was neck deep in working on my book CraftActivism with Joan Tapper, and busy with my usual work as a commercial photographer. So I put the files aside till last year, when I realized I wanted to continue and maybe get a more rounded collection, with animals and vendors and volunteers. Then..we'll see. FYI Even if you posed last time, come by again. It'd be fun to have 2 years' of outfits, right? ps that is the very wonderful Earthchicknits in the photo above. Sadly, she won't be at the festival this year. Do you follow her blog ? You should! pps I am still, after all these years, unable to hit reply from the comments. eh , whatever, blogger is free and I still like the platform.....but if you want me to reply to you, leave an email (you can do it with a SallyKnitsATxyzDOTcom or just email me, the address is in the sidebar. You can shoot me any time! I find it thrilling! Oh.... I am SO coming by this year! Love this project! Just last night I was thinking. . . I have so many unphotographed FO's, if I see Gale again at Rhinebeck, and if she has her camera, I'm gonna be bold and ask her to shoot me. I will find you. Yay! I wish I could be there on Saturday. Can't come until Sunday this year. Looking forward to seeing the results of this project. I'm staying till Sunday after all--I'll plan to set up and shoot just for the early part of the day--or if Saturday is bad weather, I will stay longer. I plan to come by! Funny enough, I'll almost certainly be wearing the same sweater I wore when you shot me in 2010, but this time I'll have my 11 month old daughter wearing a wee matching version of it with me! If I could be there, I would! Have fun! Whee, of course I'll be there again. Even if you don't do anything with these photos in the immediate future, they will be an awesome record of the times. 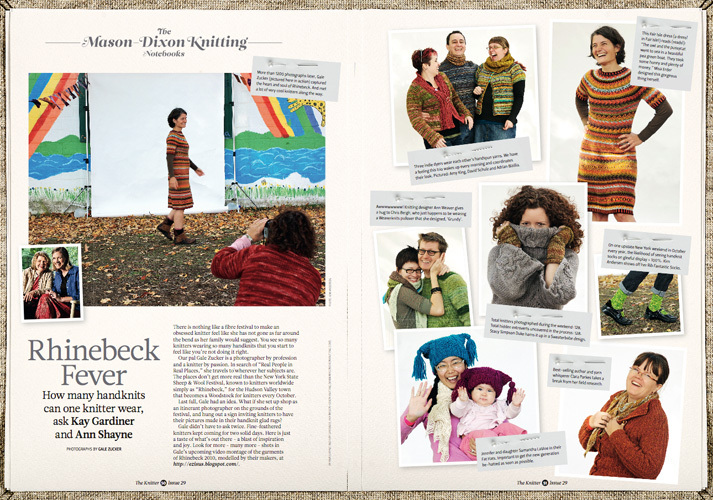 Seeing myself in print in a lovely UK mag ain't so bad either! Thank you, thank you, thank you, Gale, for doing this project and for putting up with people like me who arrived with an excess of handknits, even for Rhinebeck. 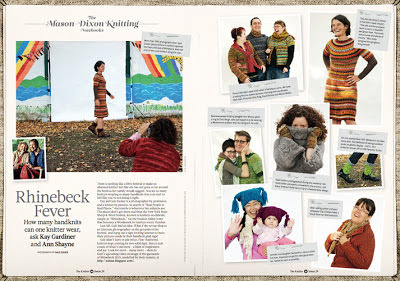 Hi there - just wanted to say that we had a blast getting our photos taken (I was the ones throwing leaves with my niece :-) and I envy you your front-row seat for the Parade of Rhinebeck Knits!